We recently discovered a Brewster’s Warbler (pictured above) in one of our conservation areas, while doing a breeding bird survey. First discovered by William Brewster in 1874, it was initially thought to be a new species. It even received its own scientific name, Vermivora leucobronchialis. It was later discovered to be a hybrid of the Blue-winged Warbler (Vermivora cyanoptera) and Golden-winged Warbler (Vermivora chrysoptera). Brewster’s Warbler is a rare find and an opportunity to learn more about this fascinating genetic hybrid. Visually, Brewster’s Warbler is a combination of dominant genetic characteristics. It has the typical black eyeline of the Blue-winged Warbler, and a white and grey colouration. Its two wing bars can be either yellow or white in colour. Females are generally paler than males and have more yellow on the breast. Colouration also varies depending on each bird’s particular genetic mix. It’s possible you’ve heard a Brewster’s Warbler singing and not known it. The song can sound like either of its parent species: the “zeee bee bee bee” of the Golden-winged Warbler, the “beeee buzzzz” of the Blue-winged Warbler, or an odd combination of the two. That’s why it’s important to visually identify the bird instead of relying on song alone. Lawrence’s Warbler is another hybrid of the same parent species. It looks different than Brewster’s Warbler because it exhibits only recessive genetic characteristics inherited from its parents. It has a black throat and mostly yellow body. The recessive characteristics mean Lawrence’s Warbler is even rarer than Brewster’s. Both hybrids can breed with either parent species, creating “backcrosses”. Blue-winged and Golden-winged Warblers look different, sing different songs and spend winter in different places. The Cornell Lab of Ornithology found that the two species are 99.97 per cent genetically similar. Any differences we see in the species are really only “feather deep”. Scientists once thought that human impacts to land and forested areas are why the species mixed, by creating new-growth forests through extensive logging that allowed the species to come into close proximity to each other. 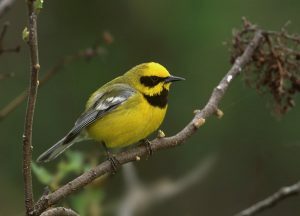 However, scientists have found that the warblers have a history of cross-breeding, dating back well before any significant human impacts to the land. The two parent species of warbler prefer similar forest-edge habitat, found in parts of the Credit River Watershed. The next time you’re out in nature, keep your eyes open for this fascinating genetic hybrid. While Brewster’s Warbler is quite rare and will be a tough find, there are many other amazing bird species you can observe at our conservation areas. Visit Island Lake Conservation Area, Rattray Marsh Conservation Area, or Upper Credit Conservation Area to see them.